Not to be mistaken for the patented, red-fleshed Mountain Rose apple grown in the Mt. Hood River Valley of Oregon. Our Mountain Rose was discovered in 1985 as a wild seedling tree here in Ashe County. 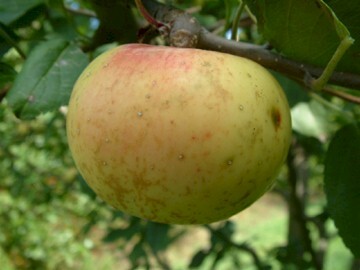 The Ashe County Mountain Rose is an exceptionally attractive early fall apple with a pleasant, tangy flavor. The tree is vigorous, strongly branched and very prolific. Fruit is small to medium with beautiful, smooth lemon-yellow skin with a faint rose blush on the sunny side. The yellowish white flesh is tender, crisp and juicy. Ripens September.